Hello! Gemma here, co-found of The Wedding of my Dreams. As some of you may know I recently got married in Tuscany, a small village called Bagno Vignoni. Some of you have been asking for more photos from my wedding so I thought I’d write a series of blog posts showing you some of the details and styling I created for my wedding. Today we are starting with the ceremony, and in particular the confetti petal bar. Our ceremony took place under a lodge in the heart of the village. The lodge was long and narrow so leant itself well to a ceremony, at one end of the lodge was more open space. In the space I chose to have a petal bar for all our confetti, this not only looked pretty but guests were able to help themselves to a handful. 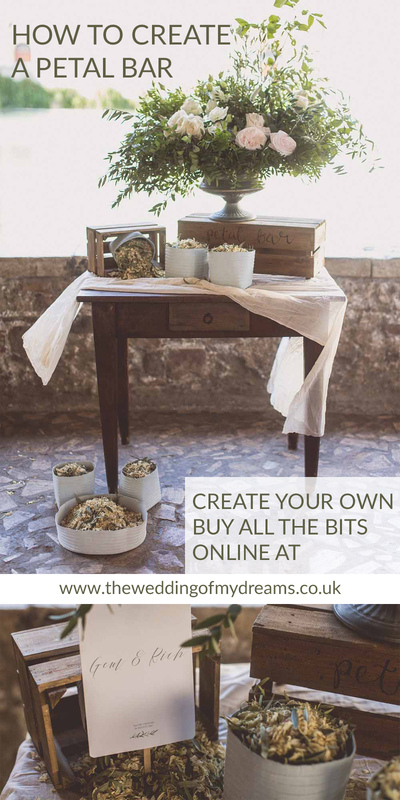 If you want to create a petal bar at your wedding ceremony here are the items I used and links to them so you can create one yourself. First you will need a table, your venue may be able to help out. We were lucky enough to borrow one from one of the small B&Bs in the village. If the table is wooden like mine was a cream table runner would lighten it, our crumpled cream runners billow in the breeze and look so floaty, I love them and use quite a few of them at my wedding. On the table you will need confetti (of course) I chose all one colour, I went for ivory delphinium petals but wanted to add an Italian twist to them. So on the morning of my wedding added Olive leaves into the mix (this would always have to be done last minute as the leave will crisp up and may wilt). I wanted guests to be able to take a handful of confetti rather than a small bag or cone, so I used our recycled paper containers in different sizes and just poured mounds of confetti into them! To make the confetti table pretty we added an urn of relaxed florals (created by our team, we’re also florists and run Passion for Flowers). The urn went on top one two of our wooden crates turned upside down and I wrote ‘PETAL BAR’ on this in a black marker pen. Another wooden crate was laid on its side and with a container of confetti pouring out. I was so happy with how this turned out and guests loved it. They all took loads of confetti in their hands and created a tunnel in the village for us to walk through while they threw it over us.